I recently came back from a trip back home to Cape Cod, Massachusetts. As always there are a few small shops that I make it a point to visit while I’m there. One of them is Tibetan Mandala, located on Main Street in downtown Hyannis. What I like about this store is the feel of it. It’s like stepping into a sacred space. Although I do not know the name of the shopkeeper, I would recognize her kind face anywhere. She has a presence that is serene and reverent. She has the kind of energy that is like a still pool. Just walking around the store sometimes makes me feel like I’m disturbing sacred ground! I walked over to the case housing all of the beautiful jewelry that I enjoy perusing every year. Usually I’m in the market for sterling silver jewelry with semi-precious stones. I’ve always steered away from the other pieces there that were more specifically Buddhist. This time I found myself drawn to the left side of the case where she had some very interesting pieces with Tibetan writing on them. My logical mind was saying, “Those aren’t for you! You aren’t a buddhist and you don’t know what they mean.” But my intuition was buzzing like a hive as if I’d stumbled upon something that I recognized from a long time ago, in a memory far, far away. As I said, I try to be very quiet in this store because it’s so peaceful, but I had to ask about these pieces. The shopkeeper told me that it was a Tibetan prayer to the buddha of compassion meaning ‘the jewel in the heart of the lotus.’ She wrote it down for me on one of her business cards so I could look it up later. 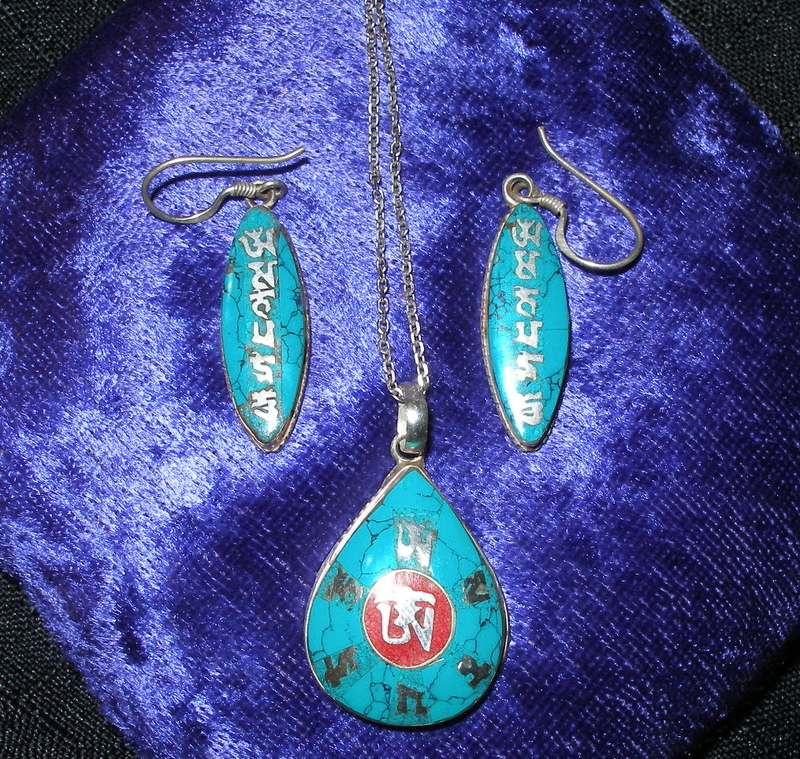 Turquoise earrings and pendant with the mantra "Om Mani Padme Hume"
Because I had limited internet access while on vacation, I had to wait until I got home to find out more about this Tibetan Buddhist Prayer. I did a search and found a site called Dharma Haven that answered my questions. It is a prayer that asks for the ability to remove our fixation on ourselves and to step into a place of absolute compassion for all living things. This is a message I’ve been receiving from my guides over the last few weeks- to remember to come from a place of compassion in all things. It was confirmation that I was on target with my guidance, and together with the Tibetan Singing Bowl that also caught my eye, I now have a way of focusing on that intention and sending it out to the universe. I’ve always been fascinated with this form of prayer, but it’s always been from a distance, despite my many visits to this wonderful little store. This was the first time I actually purchased items. This was the right time and the right vibration for me in this moment. realm of possibilities for our spiritual path. In the end, we choose for ourselves. There is no one right way. On this site, I also found a story that truly touched me. I am reposting here, but you can also visit Dharma Haven and read it there as well, along with more information about Tibetan Buddhism. The meditator gave the correct pronunciation, and the old hermit was very grateful, asking to be left alone so he could get started right away. On the way back across the lake the meditator, now confirmed as an accomplished teacher, the meditator was pondering the sad fate of the hermit. Follow your inner wisdom. There is no right way, there is only the vibration of your intent. It is what you hold in your heart, that God hears regardless of what form of prayer or language you use. Follow your heart, and you will find your way and your truth! ~ by healingstarspirit on July 31, 2011. I love both of these stories…how beautiful…yes…intention must be the key…I love hearing whispers from Spirit, sometimes they take a long time to put together, but when you do….Goose Bumps…That’s what you always give me Nicole!! Thank you! !